1860 The Coastguards took over the crewing of the Hastings Lifeboat because no civilian crew could serve. 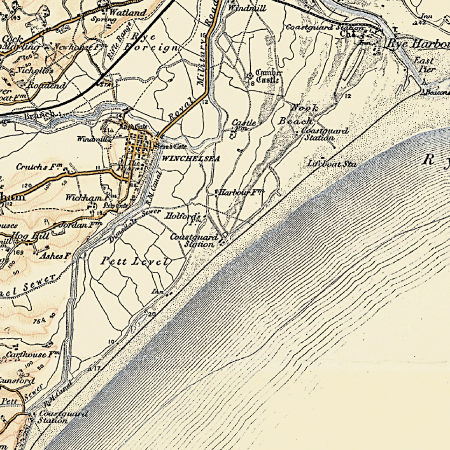 1861 The ten-yearly census records 10 men at Fairlight described as Coastguards, plus families. Also there are two “commissioned boatmen” at Cliff End Cottage, plus families, and 11 Coastguards and families at Pett. Coastguard strengths in 1922 were said to be: Eastbourne 4; Bexhill, St Leonards, Fairlight, Pett 2 each; Rye Harbour 3; Jurys Gap 2 . 1926 August: Pett Coastguard Station was sold by auction at Castle Hotel, Hastings..